Please ask about staying for one night - we do that, but for a slightly extra charge. You will drive down the treelined driveway into a private farm house that will be yours for as long as you want to stay. The animals are all farm animals, but some of the sheep are pets and will always come up for a feed as will the four alpacas and the ponies. The ponies will love a cuddle and a brush and the feed and grooming equipment is all provided. The alpacas like to see and investigate you, but they may not let you touch them. Just stay still and THEY will do the exploring! We are only 5 minutes away by car if there is anything you need and if we are away there is always someone for you contact if you need a hand. Moeraki Boulders is 15 minutes away and Moeraki itself 15 minutes. Only 20 minutes from Oamaru and 1 hour from Dunedin it is very conveniently located. The nearest neighbours are 1 kilometer away, so it is extremely private with a sunroom (beautiful in the mornings) and a huge garden which is very safe for the children to play hide and seek. There is a garage to park your car and plenty of room for the boat or horsefloat and spare paddocks for horses. The garden in spring is beautiful from September through November. You will be left to your own devices, however, we will call in to introduce ourselves on the first or second day of your stay and full instructions will be given on how to feed and groom your animals while you are in residence. We have farmed all our lives, so to us it is second nature. For you we are sure it will be an enjoyable experience. 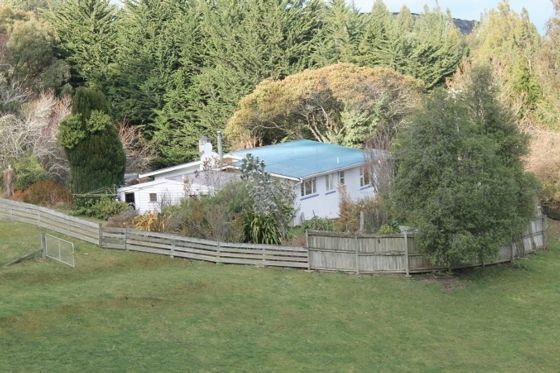 This property compliments Forest Hill Cottage also listed which is only 5 minutes away. Pets are most definitely welcome. We are so pleased you enjoyed it and we hope you have a lovely trip around NZ - we would welcome you back one day! Stayed here 6 times, and every time it has been good as the previous visit, Leslie and Brian are great hosts and very welcoming. What can I say. We so enjoy having you stay and hope you will be back again. Can't believe it is 6 times!! When staying in or around Oamaru, ideal. on Main road so a bit of traffic noise. A lovely cottage with a great layout. A lovely cottage with a great layout. Beautiful and private location to get away from it all. Wonderfully tranquil and peaceful. We loved the chickens and other animals. Great local amenities, beaches and sights are just a wee drive away. Great stay! We'd certainly stay again. Thank you Lesley! This property is very clean and spacious. This property is very clean and spacious. It is great for families with children. The animals are all tame and can be hand-fed. There is no wifi (if you need that sort of thing - we did not care). It is close to a busy road so if you are very sensitive you might notice traffic noise. It's not so close as to be worrisome for children (there are paddocks between the house and road so very safe for kids). We found it to be great and would highly recommend. The owner is very nice.